The Quilted Nursery Fabric Store. Fun fabrics for fun kids. 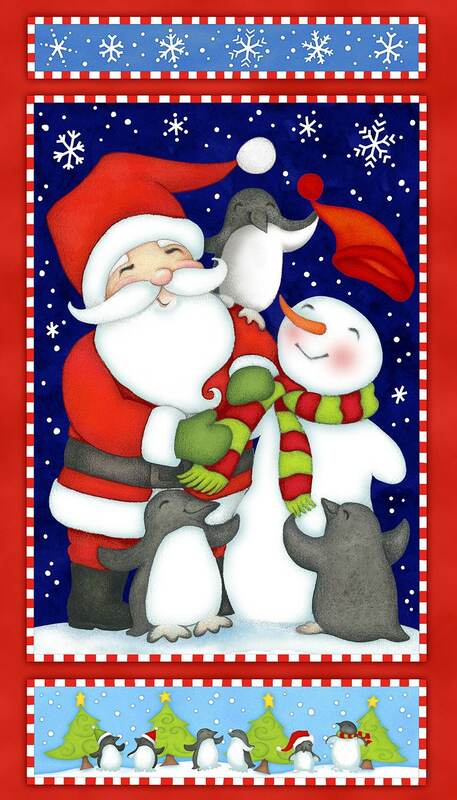 Santa and his Penguins have arrived at The Quilted Nursery Children's Fabric Store. We are so excited to welcome Santa and his friends to our fabric store. This deliciously warm 2 ply flannel show cases bright shades of red, blue, green, white and black. Santa with his delightful laugh and wonderful Santa suit and silly penguins will warm up not only your favorite child but your favorite elf! All fabric from The Quilted Nursery Children's Fabric Store is cut directly from the bolt in continuous yardage. We also offer fractional yardage cuts for your shopping convenience. All fabric is shipped in 24 hours and all shipping overages are refunded on shipment of fabric! The Quilted Nursery accepts Visa, Mastercard, Paypal and personal checks. Should you choose to pay with a personal check your merchandise will ship once we have received your check in the mail. The Quilted Nursery ships using the USPS . There is no tax assessed on your orders as Montana is tax free. Same day shipping always! The Quilted Nursery will gladly accept returns within 7 days of receipt of your merchandise. On special orders we will assess a $50.00 restocking fee. If you require custom fabric yardage please send The Quilted Nursery a conversation and we will be happy to accommodate your request.